Have a cedar log home that was stained 5yrs. Ago with sikkens stain. 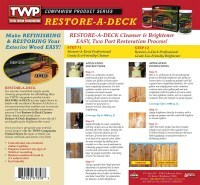 Plan on using TWP 1500 on the cedar logs. 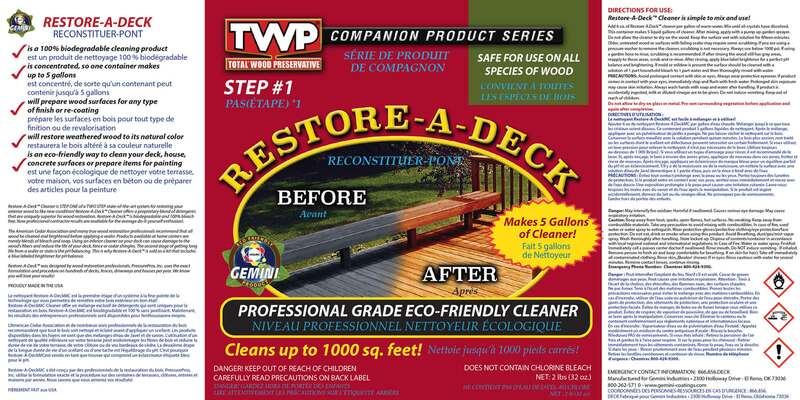 What prep do I need to take first, Restore a deck stripper or cleaner? Strip and brighten the wood. I live in south central TN and have a large new covered porch built of pressure treated wood and finished in September (7 months ago). Because the porch is covered, there has been minimal UV in that time. I have 2 questions. 2. I have heard that you can 'speed' the waiting time by lightly sanding and lightly pressure washing to 'break' the barrier created by mill scale and pressure treatment. Do I need to sand. I will if necessary to allow me to stain now, but obviously I'd rather not if it's not necessary. 1. Yes. Only 1 coat of the TWP. 2. No, you cannot speed up the waiting time. No need to sand. 1. I'm good to go now at 7 months with no need to sand. 2. Your recommendation is 1 coat instead of 2 'wet-on-wet.' Obviously I'd like to save money on material cost, but I'm a bit confused as to the recommendation for 1 coat when most other places on this site the standard recommendation seems to be '2 coats wet-on-wet.' Sorry to be dense, but could you clarify a bit? 3. And on a totally different subject, I'm a bit confused about the need/utility to pressure wash. I understand the pressure washing is to wash off residue, but exactly where in the preparation process does pressure washing fit? A. After the deck cleaner but before the brightener? C. Someplace else in the sequence? 3. Helps to remove the oxidation after the cleaner loosens it up. You apply the cleaner and then pressure wash off. You rinse off the residue, apply the brightener, rinse that after 15 minutes. We have an 8 year old pine deck, with railings and steps in NY. We used the RAD cleaner and brightener 4 years ago. We coated with 1515 honeytone. I am planning on doing the same process this season. First, if I am going back with the same stain tone/color do I need the stripper or can I go with the cleaner and brightener? Second, I have an unopened can of the 1515 honeytone dated 3/2015. Is that stain still able to be used or is it too old? 2. Hard to say. Best to open and make sure it mixes evenly without clumping. 3. Since it has been 4 years, do the two light coats wet on wet. I have a deck with new pine 2x6 planks and it has never been stained.. It has dried for 1 year and now we are ready to stain. Is this the proper preparation product? After I perform the gemini clean and brighten to existing deck, do I need to need to stain within 1 week or 2 weeks...or what would be max timeline I can wait before staining. Sometimes the rain pushes staining back till the next weekend. Stain within 2 weeks of the prep. We have an old pine deck. We've removed all the paint and primer and did an overall good sand with a floor sander. I needed to go over some of the boards were the paint/primer was really sticking with a belt sander. Now those boards look very new, while others are more gray. Do I need to sand down the gray boards? We intend to order the RAD kit to clean and brighten. If I don't sand the gray boards down more, will the RAD kit help even out the look once we stain? The RAD prep kit will remove the gray. No need to sand. Thank you! All things considered, I live in Colorado with full sun and snow. I have access to the 100 series, but I have my eye on the honeytone in the 1515. Do you recommend the 100 or 1500? What color in the 100 would be closest to the 1515? Also, will left over stain in the 5 gallon bucket last a few years? 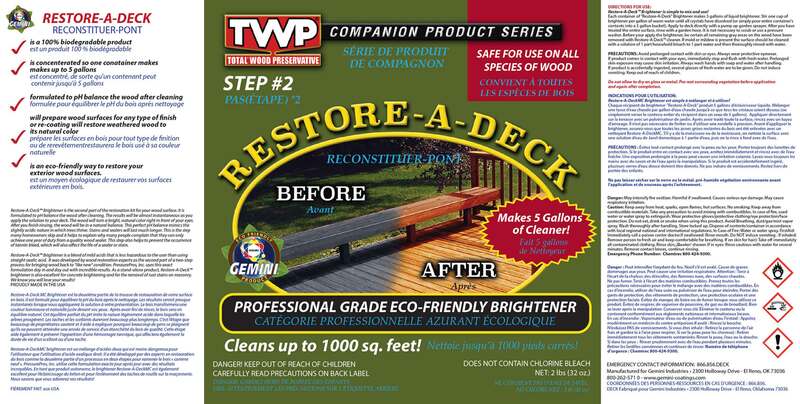 TWP 115 Honeytone is the correct stain for this in CO. No, opened containers will not last a few years. 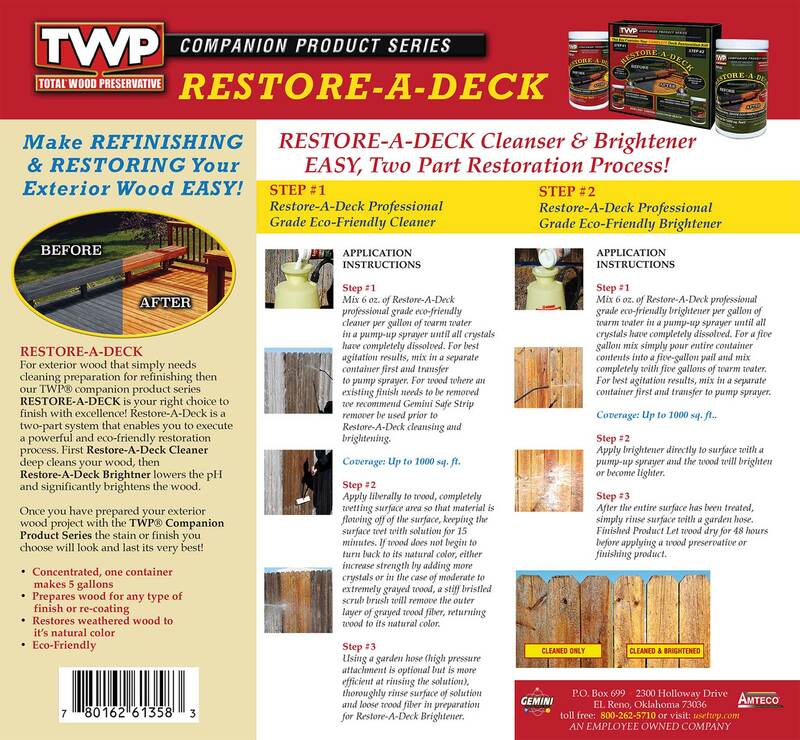 My deck was stained 3 years ago with TWP 1500 series. I would like to clean and brighten it with Restore a Deck. Is it okay to apply this product without staining? If you use the RAD cleaner and brightener than you will need to restain. I am going to replace boards on a dock with cedar. I left them outside for 5 months until December and have been in the garage since. I will clean them off as they are graying before staining. Do I stain both top and bottom since will be over water or just the top? How long a drying time before staining? Just the top. After prep, wait 48 hours to stain. 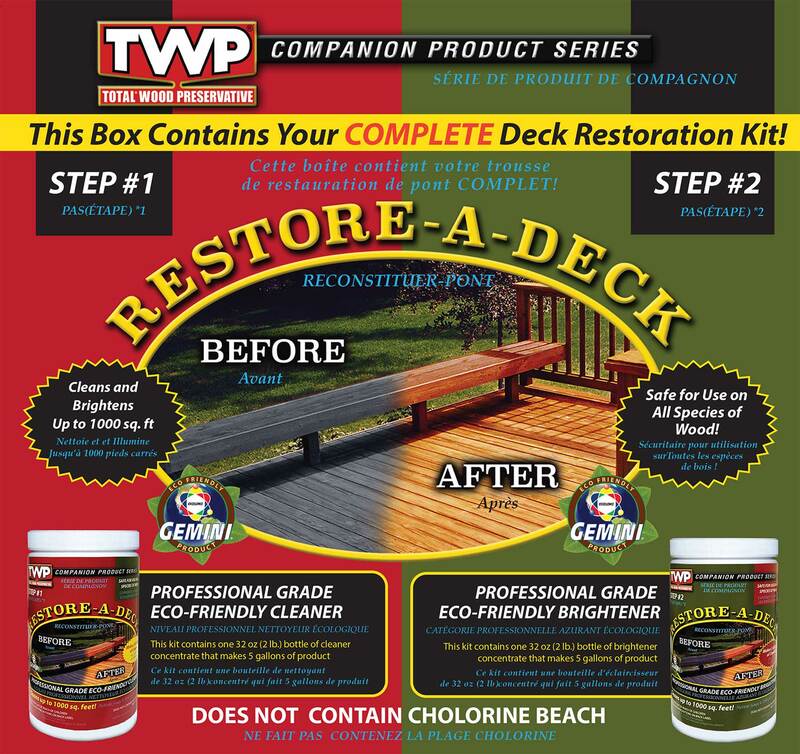 Can Restore-A-Deck be used on an Ipe deck? Every 2 years I have power washed and stained my cedar deck. In 2017, I used the 1500 series. Was thinking of stripping the deck this year instead of just cleaning before staining. Is the RAD stripper safe for cedar? Thanks. Do I use the same cleaner and brightener on cedar siding, shakes, and pressure treated lumber? When using the RAD Stripper & Brightener will it damage glass (windows) or vinyl siding? It will not but rinse well to remove all dirt and soap residue when done. My cedar deck was built last summer and has grayed over the winter. I want to brighten it back to its natural color but don’t want to use a pressure washer. I figured on scrubbing it with a brush and sanding it before applying a TWP stain. Should I use the deck cleaner or just the brightener or both? Use both cleaner and brightener but a pressure washer will make this much easier. You have to remove all of the oxidized wood fibers and scrubbing alone will be difficult. It has been 1.5 yrs since applying the initial coat (Sept 2017) of TWP 1500 series. I am planning on applying a maintenance coat of the same series and color this spring. I have a couple questions. 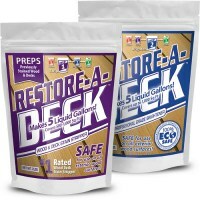 I was told to use the Restore-A-Deck Kit (cleaner & brightener). Is that correct or should I just use a cleaner before applying a maintenance coat? Since I am only applying a maintenance coat, I will only need to apply the stain to the horizontal boards, correct? Use both. If verticals are good, just do the horizontals. I applied 100 Rustic Oak 2 years ago and I am looking to do 100 Dark Oak this year. Do I need to strip and start over even though I am going darker or can I use this RAD kit? Thanks. We stained our fence 4 years ago with the TWP cedar tone stain. It has held up well but needs to be restrained this year. 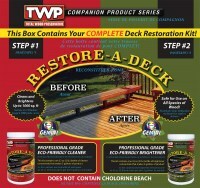 What is the process we need to use to do that if we plan to use the same TWP cedartone color stain? Prep with the Gemini Restore Kit prior to reapplying is correct.